Figure 8.5 Representative polymer-polymer phase behaviour with different molecular architectures. Microphase separation (a) results when thermodynamically incompatible linear homopolymers are mixed. The covalent bond between blocks in a diblock copolymer leads to microphase segregation (c). A mixed architecture of linear homopolymers and the corresponding diblock copolymer produces a surfactant-like stabilized intermediate-scale phase separation (b). Figure 8.6 Representation of the variety of polymer morphologies in solution and in the gel (or microgel) or solid states. 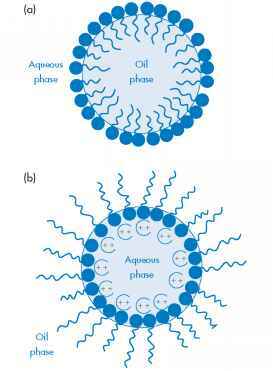 In solution the conformation of the polymer depends on the nature of polymer-solvent interactions and whether or not the polymer chains associate to form micellar aggregates. Crystals of polymer and microcrystals can be prepared, and gels can be formed from covalently crosslinked or polymer chains associated by hydrogen bonding or hydrophobic interactions. 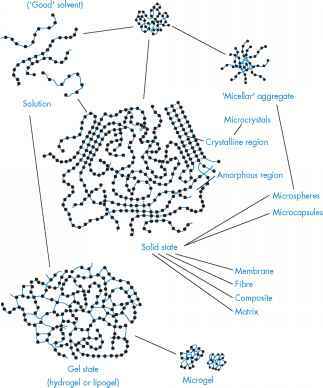 Listed are the forms in which most polymers can be fabricated: membranes, fibres, composites, matrices; micros-pheres and microcapsules can also feature, as discussed later in this chapter. Table 8.2 Number and weight average molecular weights for dextran fractions"